Giuseppe3 Gerardi(Giuseppe2, Francesco1) was born 30 May 1796 in Calatafimi, Sicily. He married Vita Vultaggio 16 Jan 1819 in Calatafimi, Sicily. *Giuseppe Maria3 Gerardi, born 15 Nov 1819 in Calatafimi, Sicily. Died 11 February 1821. 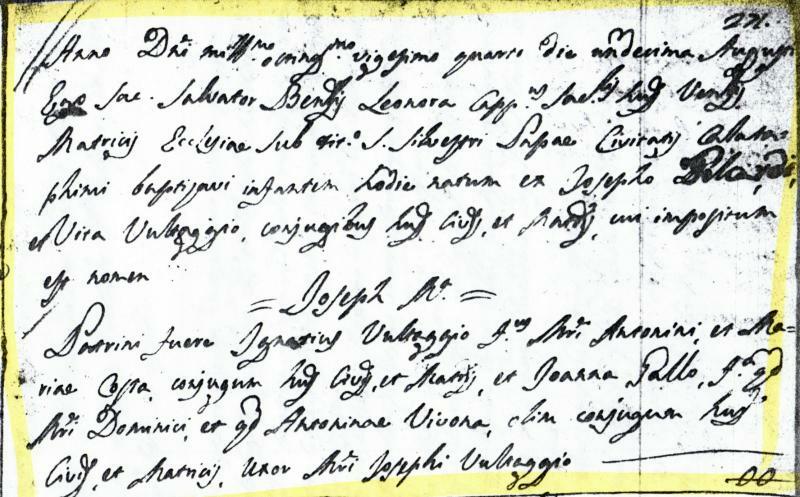 Father Girolamo Maria Benedetto Simone of the San Silvestri Papa church in Calatafimi baptized an infant born this morning to Giuseppe Gerardi and Vita Vultaggio, who are married and of this town and they imposed the name Joseph Maria. 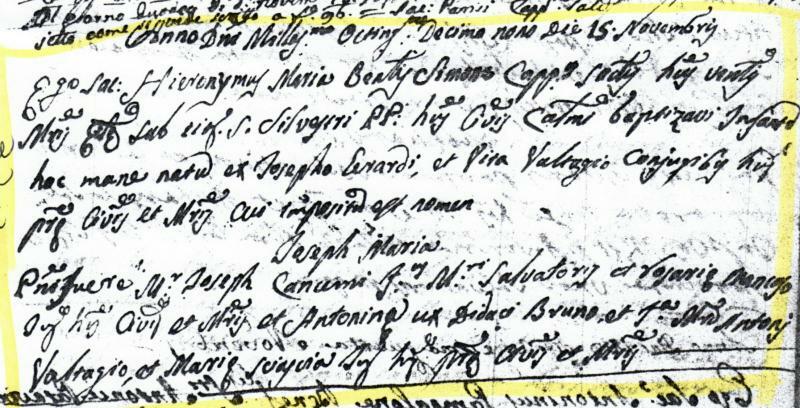 Godparents are Joseph Cancemi, son of Salvatore and Rosaria Mancuso and Antonina Didaci Bruno, daughter of Antonino Vultagio and Maria Scioscia. Caterina Maria Gerardi, born 16 May 1822 in Calatafimi, Sicily. I, Father Vincenzo Miceli, of this church of San Silvestri Papa, in Calatafimi, baptized an infant born today to Giuseppe Gerardi and Vita Vultaggio, who are married and they imposed the name Caterina Maria. Godparents are Francesco Barbiero, son of Blasio and Teresa Mirabile, and also Antonina Scioscia, daughter of Ignazio and Antonina Internicola, wife of Francesco Taranto. Giuseppe Maria Gerardi, born 11 Aug 1824 in Calatafimi, Sicily. I, Father Salvatore Benedetto Leonora, of this church San Silvestri Papa, in Calatafimi, baptized an infant born today to Giuseppe Gelardi and Vita Vultaggio, who are married and of this town, and they imposed the name Giuseppe Maria. Godparents are Ignazio Vultaggio, son of Maestro Antonino and Maria Sciocia, and Giovanna Gallo, daughter of the late Domenico and the late Antonina Vivona, wife of Maestro Giuseppe Vultaggio. Antonino Maria Gerardi, born 28 Jun 1827 in Calatafimi, Sicily. I, Father Salvatore Benedetto Leonoro, of this church San Silvestri Papa, in Calatafimi, baptized an infant born yesterday to Giuseppe Gerardi and Vita Vultaggio, who are married and of this town, and they imposed the name Antonino Maria. Godparents are Gaetano Vultaggio, son of the late Maestro Antonino and Maria Sciacia, of this town and Gaspara Bonventre, daughter of the late Antonino and the late Lucia Internicola, wife of Pietro Lampazona. Francesco Maria Gerardi, born 21 Jul 1830 in Calatafimi, Sicily. I, Father Leonardo Catalano, of this church of San Silvestri Papa of this town, baptized an infant born yesterday to Giuseppe Gerardi and Vita Vultaggio, who are married and they imposed the name Francesco Maria. Godparents are Angelo Montalbano, son of D. Andrea and Dna. Antonina Grappone, of this town, and Anna Montalbano, sister of the godfather. Maria Gerardi, born 28 Aug 1833 in Calatafimi, Sicily. I, Father Leonardo Catalano, of this church of San Silvestri Papa, baptized an infant born this morning to Giuseppe Gerardi and Vita Vultaggio, who are married, and of this town, and they imposed the name Maria. Godparents are Gaspare Leo, son of the late Francesco and the late Maria, of this town, and Antonina Brucalere, daughter of Giovanni and the late Angela Caprarotta, of this town, wife of Giuseppe Leo. You may click on underlined text to view supporting documentation or click on the lower right corner of the images below to enlarge.